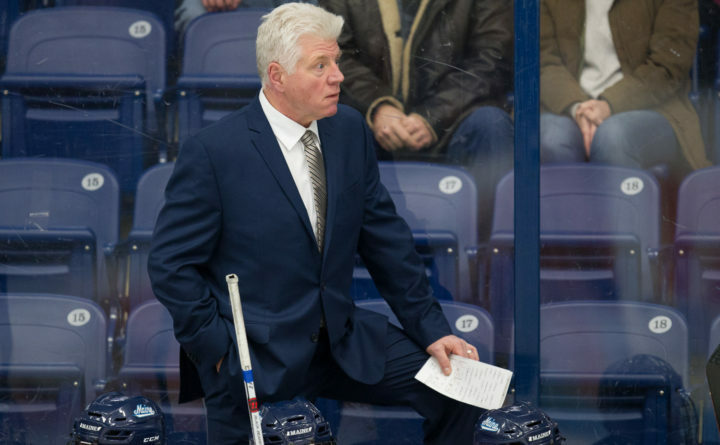 University of Maine men's hockey coach Red Gendron, pictured during a game at Alfond Arena last season, is cracking down on players who take unnecessary penalties. The Black Bears are the second most penalized team in the country so far this season. Following a 1-0 loss to UMass Lowell on Saturday night, the University of Maine men’s hockey team has a weekend off before returning to Hockey East play with games Nov. 16 and 17 at Boston University. Head coach Red Gendron’s Black Bears are the second most penalized team in the country among the 60 Division I teams, averaging 19.9 penalty minutes per game. Only the University of Minnesota (20.8 mpg) has been more penalized. BU ranks third (19.7 mpg). UMaine was the fifth most penalized team a year ago with 15.1 penalty minutes per game. Gendron is fed up with the trend and will continue to address the situation. “On Saturday, penalties put us back on our heels,” he added. The Black Bears took three successive minor penalties in the first 9 minutes, 37 seconds of the game. “Their first 10 shots on goal all came on the power play. Those penalties were unnecessary,” said Gendron, who cited similar incidences in the second game at Minnesota Duluth and both games at Connecticut. Conversely, UMaine has done an exemplary job on the penalty kill, posting an 87.8 percent success rate, which is 11th best in the country. Gendron has begun benching players for taking unnecessary penalties and said he will continue to do so. Perez, a senior left winger, took a five-minute major for hitting from behind and received a game misconduct in the third period of Friday’s 4-3 win over UMass Lowell. UMaine led 4-2 at the time and wound up killing it off. Perez was not in the lineup Saturday night. In Saturday’s game, junior center and co-captain Chase Pearson took a cross-checking penalty in the offensive zone with 19 seconds left in the second period. It was just 33 seconds after UML’s Jon McDonald was assessed a five-minute major and game misconduct for contact to the head. The game was scoreless at the time. Pearson, UMaine’s leading goal scorer (5), including two in Friday night’s victory, spent virtually the entire third period on the bench. “If you take unnecessary penalties, you can expect to lose ice time. End of story,” Gendron said. Gendron has great expectations for this UMaine team (3-4-1, 1-2-1 Hockey East). UMaine is 1-4-1 in its past six games and has given the opponents 37 power-play opportunities in those games while being awarded 27 power plays itself. UMaine senior defenseman and co-captain Rob Michel and sophomore goalie Jeremy Swayman, who had 44 saves in Saturday night’s loss, said they are confident the team can turn things around. And a weekend off can’t hurt. “It’ll be a good week for us just to [recuperate], really focus on our discipline issue, for sure,” Michel said. “’We have to continue to trust our process. Gendron said the week off will give players who are dealing with nagging injuries a chance to get better. UMaine is averaging only 2.38 goals per game, which ranks 40th in the country, and is tied for 33rd in scoring defense (3.0 gpg). The power play is 52nd at 11.9 percent, although it did produce two goals Friday night.